Once again, Vancouver has taken the title of the most congested city in Canada according to the annual rankings released by TomTom — a company that markets GPS systems — but that doesn't tell the full story, according to an expert in traffic congestion. "I take these ratings with a very large dose of salt because I don't think they're terribly accurate," said Joe Cortright, who studies traffic patterns as the director of Portland-based think-tank City Observatory, told The Early Edition's Rick Cluff. In the rankings, Vancouver was named the 20th most congested city in the world — and the most congested in Canada, followed by Toronto, Ottawa and Montreal. The rankings use the GPS devices to measure how long it takes commuters to travel a route during rush hour, compared to the time of the trip when there is no traffic, which Cortright said limits the sample. "The people who buy TomTom devices are people who spend a lot of time in their car and who are using it to avoid traffic," he said. "It tends to exaggerate the extent of congestion." Cortright said another problem with the data is it uses percentages to measure congestion — meaning an increased time for a short trip accounts for a larger percentage than on a longer drive. "If you're in a dense, compact area where the destinations are close at hand, even if the traffic is a little bit heavier in certain places, you end up spending a lot less time in your vehicle." Cortright said there are other ways of measuring congestion — giving the example of U.S.-based company Inrex, which monitors how quickly cell phones move between cell towers. The latest traffic scorecard from Inrex puts Montreal as the most congested city in Canada, followed by Toronto and Vancouver. Ultimately though, Cortright said the best judge of how bad a commute is are the drivers who deal with it daily. "That's hard for an outsider to judge, because traffic is experienced by people who live in the community," he said. To hear the full interview with Joe Cortright, listen to the audio labelled: TomTom's Traffic Index challenged. 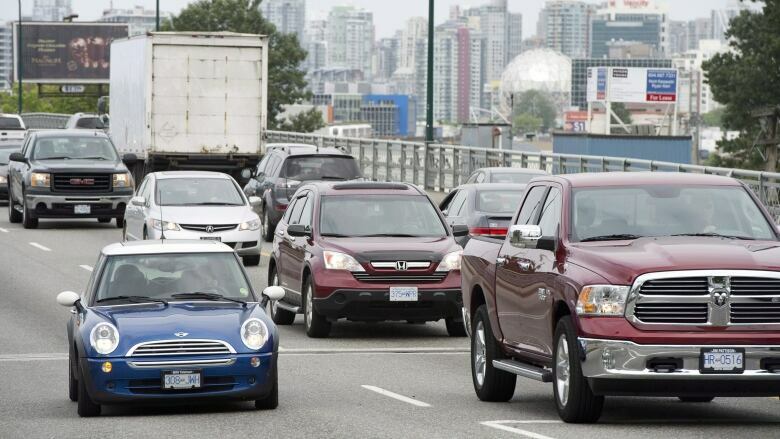 Is Vancouver the most gridlocked city in North America?